Nothing quite like new toys, new cars, good friends, and a day of experimenting in beautiful LA weather with Mister C being the home base for the day… two weeks ago we brought our new Contour+ mini HD action cam with us to meet up with Bentley’s fleet en route to Monterey… armed with suction cups, we had far too much fun mounting the camera and driving all over beverly hills, bel air, and late night through the tunnel in santa monica and on pch… take a peek at the setups, as well as the beautiful 1936/37 Mercedes Roadster we found! Here’s a first from Shawn, our automotive editor, who has been exploring the world of Concours D’Elegance this weekend with me ~ i was mesmerized by these beautiful classic Mercedes-Benz White Knights! With Mercedes Benz celebrating their 125th anniversary, they commanded the stage and 18th hole on Sunday at the Concours d’Elegance at Pebble Beach. Lining the coast, the “White Knights” stood side by side collectively paying tribute to the Pre-War German engineering and racing of Benz and Daimler. 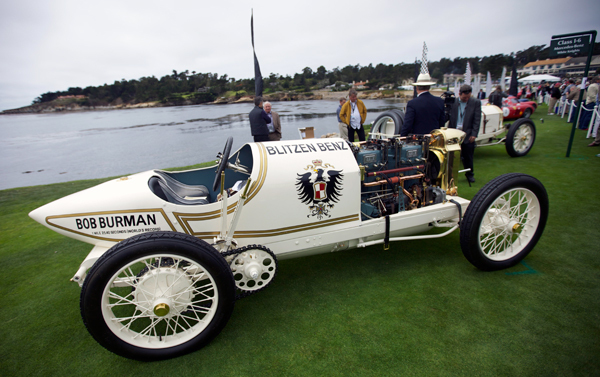 While they are all immaculate, the 1909 Blitzen-Benz is with out a doubt the grand-daddy. The 21.5 Liter four-cylinder laid down 200hp and set the world land speed record of 141mph on April 23, 1911 at Daytona Beach. It is exactly these milestones of the “White knights” that brought Mercedes their glory on and off the track. These legendary cars will remain some of the finest German engineering through time. Take a look at some of their stunning details on the next page. 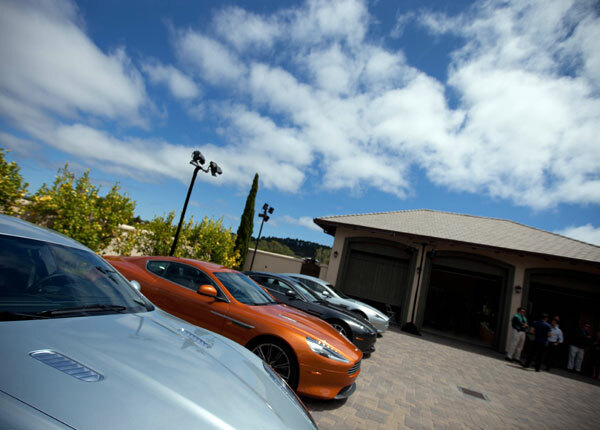 We ended up at an unexpected oasis amongst the madness of Monterey Auto Week when we drove up into Monterra Woods to join friends at the Aston Martin Estate. They took over a beautiful house and filled it with a brilliant mix of lifestyle brands from Far Niente Wines and Louis Roederer Champagne, to Emanuel Andren’s Chocolates from Sweden… Vizio 3D tvs and CxC Driving Simulators, to Flexjet by Bombardier and Worth magazine… There was even a tailor, diamonds, non-alcoholic cocktails (test drives happening! ), and of course Aston Martins ~ from the V12 Zagato and One-77 to Virage Coupés, Vantage S Roadster, and Rapide. They created a beautiful space with relaxing indoor and outdoor areas, and endless things to do. Favorite? While waiting for test drives, the garage had two 3-large-screen simulators with racing seats that throw you around almost as hard as a real F1 car. 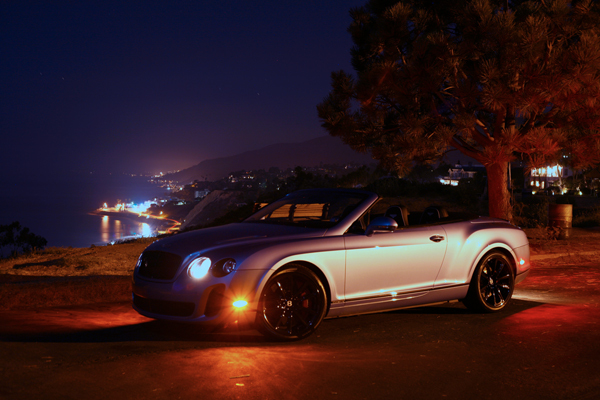 (Of course, had we planned a bit better ~ i’m sure test driving the Astons would have been the favorite!) All in all, there was so much to see and do, and it was the perfect way to get a feel for the lifestyle they imagine around the marque. There were even herds of deer and flocks of turkeys roaming nearby! Take a peek and explore the estate and details on the next page! One of the most fascinating spectacles yesterday was watching how they unload and maneuver/roll precious, concept cars into the putting green in front of the Lodge at Pebble Beach. Especially fun to watch? The unload of the 2009 Mercedes-Benz F-Cell Roadster Concept… a hydrogen electric fuel-cell powered, joystick controlled, bicycle wheeled buggy. While the press pics have been floating for 2+ years, there was something intriguing about seeing it being semi-driven/rolled around and seeing the responses on people (especially kids) faces as they watched in wonder, perhaps even imagining a reality where that could be what we drive. The wood panels on grass technique was fun to watch, take a peek at the process and details on the next page. Having spent the day with the newest Bentley’s all over LA on wednesday ~ and then being convinced to spontaneously pop up to Monterey Auto Week… the time warp to see Bentleys of the past amongst their contemporaries is quite a trip. While I wasn’t sure what we’d be able to attend on such short notice, but Bentley swooped in and have been helping guide us through the week. They were kind enough to invite us in to the world of The Quail: A Motorsports Gathering, which we were told was an event not to be missed amongst the endless car events of the weekend. They weren’t kidding. It was an incredible introduction to the classic cars, while still getting to play with the supercars of today… all while lounging on golf courses… without playing any golf. Driving cars along golf cart paths and all over greens felt so wrong, yet is so normal here! 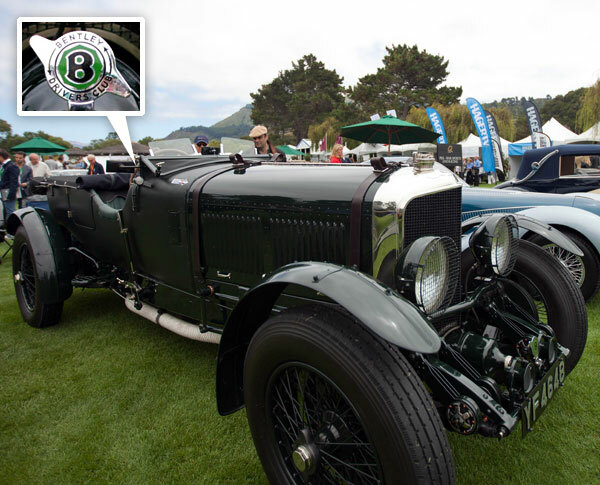 One of our surprising favorites of the show turned out to be this green 1927 Bentley 6.5L coupe! 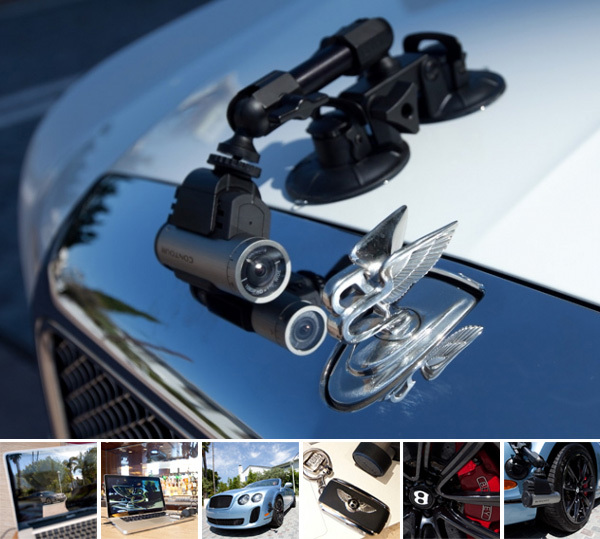 So take a peek at the awesome car above in detail… as well as a silly unboxing of the jacket that saved me from the windy/mistiness that is the monterey peninsula… on the next page! They really just don’t make horseless carriages like they used to anymore. 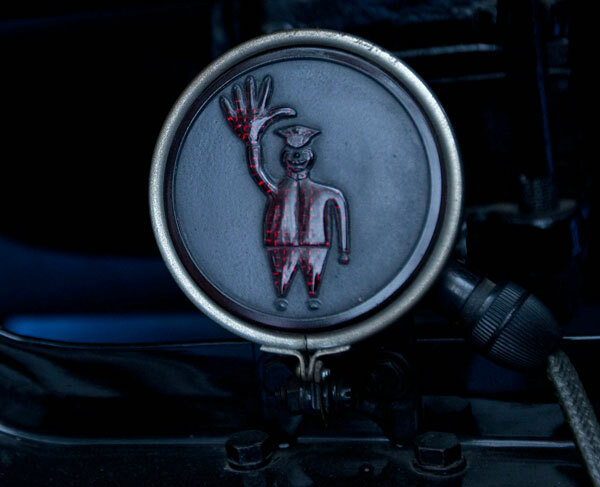 This is the brake light of the 1917 Packard Twin Six 2-35 All-Weather Landaulet. Is it not amazing? Also the license plate actually says, “Horseless Carriage” on it. See the closeups, on the next page. It’s a beautiful thing when a brand wants to encourage passionate, playful exploration. When Bentley invited us to join a fleet of their cars, Brian Gush - Head of Drivetrain and Motorsports, Robin Page - Head of Interior, a skeleton film crew, designer Cory Grosser, and former lead designer of Nokia/founder of Vertu - Frank Nuovo at Mister C in Beverly Hills, to just “be creative and play,” how could i resist? So we loaded up a bunch of new (and old) toys ~ and spent the day all over beverly hills and bel air playfully exploring these cars in new and inspiring ways… and while there is much to come from that… first things first! 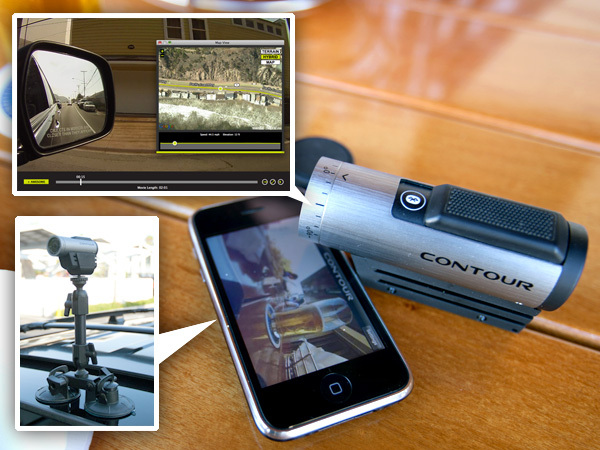 If you recall, i’ve been a bit research obsessed with mini-HD-action cams ~ and while i have a GoPro, the Contour+ was the one i was waiting for… First impression, i’m impressed with the Contour+ ~ nice packaging, solid chunk of hardware, and the 1080p video quality with GPS and bluetooth connection to both iphone and android devices as monitors are great (though a bit finicky to get connected at times) ~ while this and a few other toys just got acquired for some more playful projects coming up this week, wanted to take a moment to share the unboxing with you to get a first look at what’s included (and you know i’m a sucker for simple matte black boxes with crisp graphics) ~ so check it out on the next page, and more soon as i start playing with it more and comparing it to my GoPro… so far it already has me wishing my GoPro was more aerodynamic and had apps to let my phones be the preview monitor… anyhow, to the unbox on the next page! p.s. Unboxing occurred while famished at lunch at Father’s Office. When i wake up to an email that is like “Charging Glass? USB? I kind of want it.” and the link goes to a TOOTHBRUSH. I pop up in bed to pay attention. 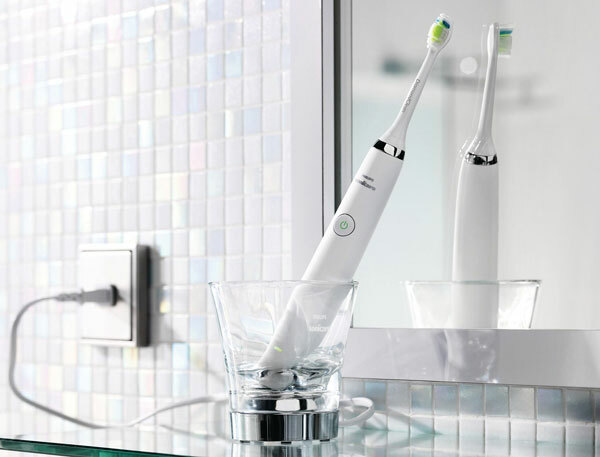 Sonicare’s new DiamondClean USB 5 mode rechargeable sonic toothbrush… beyond on the minor tweaks here and there that improve on my brushing… let’s talk accessories. How will any normal CUP compare to this magical charging GLASS? That yes, you can also use like a glass to rinse with. But more importantly, it looks nicer on your sink than having that charger for it to dock in to! More natural. What a nice user experience shift… also while on the go (or at your desk, or in your car, or when you forget your charger and just let it share with your ipad, etc) USB charging travel case! So its the accessories, and the laughable product shots with models that have me half awake and curious about this new toothbrush… or dreaming about how to convert my charger into a glass… see more pics on the next page! 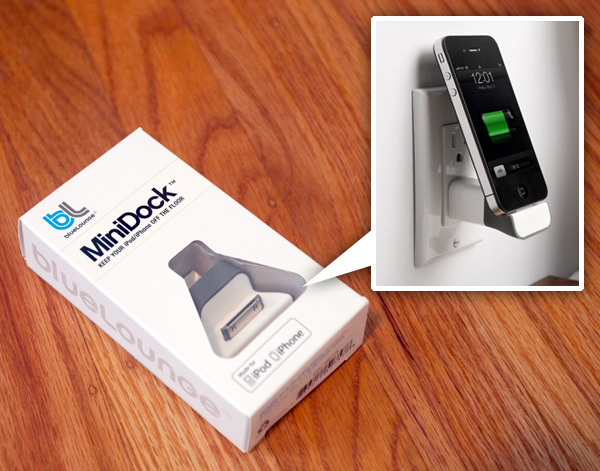 Just launched today ~ Bluelounge MiniDock! This magical little contraption means you can now charge your Apple gadgets directly from the wall socket, saving counter/floor space and cables. Perfect for hotels, sitting in airport lounges, bedside charging… you name it! As usual with Bluelounge the product feels great in your hands, the details are perfectly simple ~ as the press kit cover says “Everything should be made as simple as possible, but not simpler,” quoting Albert Einstein. Take a peek at the unboxing as well as examples of it in use (and video!) on the next page! Fresh in my inbox ~ my dad’s latest adventure seems to have landed him at Art Center for the new 2011 Pagani Huayra’s photoshoot on its way up to Pebble Beach ~ where all the stunning cars are migrating next week… from the sleek and agressive exterior styling i can’t stop staring at (and that COLOR!) ~ to the carbon fiber leaf like side mirrors ~ to the steampunk-retrofab interiors (the BUTTONS!) ~ and well, the Mercedes-AMG V-12 twin turbos and carbon fiber chasis and body… there is so much lustworthy loveliness to stare at, take a peek at his pics on the next page. Seriously, this seems like the hardest week to try to car shop with so many incredible launches and lustworthy cars passing through… enjoy the design details and sketches! The playful potential of taking the precise, programmable motions and actions of these robotic arms ~ and exploring their artistic and more “human” or organic motions ~ opens up a whole world of robotic lightwriting graffiti, painting, or a synchronized visual display (whether multiple robotic arms in one location, or across the globe) ~ the ability to explore ways that others may interact or control these robotic arms and have beautiful visual/motion captured results just send my head spinning with ideas… and perhaps that’s exactly why Shawn and i are teaming up for NOTlabs to see where else we can go with this space where art, technology, and culture are constantly overlapping… (While NOTlabs is in quiet incubation mode at the moment ~ feel free to follow us on Twitter as we figure out where we’re headed!) 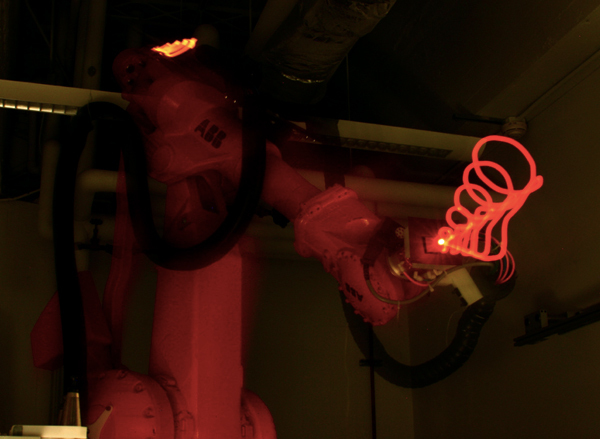 But for now… take a peek at the videos and images of the beautifully organic movements of the awesomely orange ABB4400 robot that is tucked away in CMU’s Digital Fabrication Lab as it fluidly dances and mimics with light on the next page! On surprising Comic-con discoveries, i had a great chat with the LA based, PenGo. Their latest tablet apps for painting/drawing and their new Brush Pen with three swappable tips (thick, thin, and brush!) were available to demo before launch, and they are more impressive than any others i’ve played with! 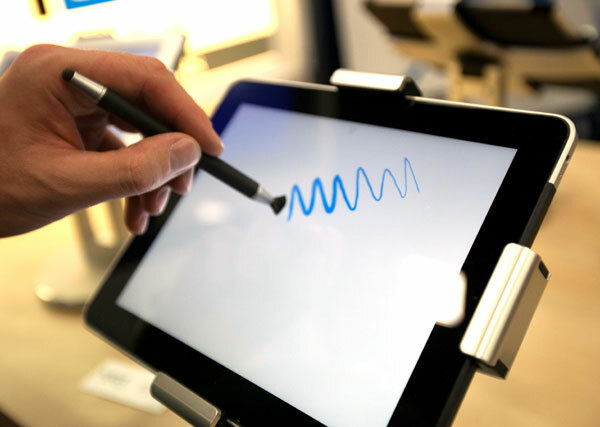 As you can see in the pic above, they’ve managed to create Wacom-like pressure based sensitivity in their latest version of their app which hasn’t been released yet. It was such a tease to get to play with their app and brush without being able to buy it yet! The ability to draw and doodle was incredibly fun! Take a peek at their newest product the Brush Pen on the next page… and keep an eye on their site for the official product launch! So i already showed you the car accident mess i was in here. Sadly my car is totalled, but luckily i’m on the mend ~ and trying to figure out the next car and how to get better as fast as possible! On a separate note… friends and family checking out the accident pics noticed that i might have been hit by a 2012 Honda CR-V in stealth super secret prototype mode? (Bonus points to my dad and Acquire for noticing this!) And all the info and mysterious lack of data on the year/make/ of the car by the police/guy who hit me… and that he was from Ohio and may work for Honda… and checking out spyshots of the 2012 Honda CR-V the design and coverings seem to match really well… So it does seem to point to them being right? 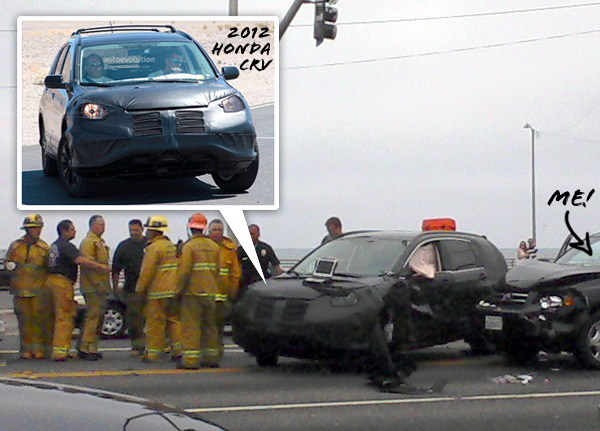 Did i really nearly get crushed in my car by a super stealth 2012 Honda CR-V?!?! See pics from the scene of the accident as well as spyshots for comparison on the next page!